A bearing is a machine element that constrains relative motion to only the desired motion, and reduces friction between moving parts. The design of the bearing may, for example, provide for free linear movement of the moving part or for free rotation around a fixed axis; or, it may prevent a motion by controlling the vectors of normal forces that bear on the moving parts. Most bearings facilitate the desired motion by minimizing friction. Bearings are classified broadly according to the type of operation, the motions allowed, or to the directions of the loads (forces) applied to the parts. Rotary bearings hold rotating components such as shafts or axles within mechanical systems, and transfer axial and radial loads from the source of the load to the structure supporting it. The simplest form of bearing, the plain bearing, consists of a shaft rotating in a hole. Lubrication is often used to reduce friction. In the ball bearing and roller bearing, to prevent sliding friction, rolling elements such as rollers or balls with a circular cross-section are located between the races or journals of the bearing assembly. A wide variety of bearing designs exists to allow the demands of the application to be correctly met for maximum efficiency, reliability, durability and performance. The term "bearing" is derived from the verb "to bear"; a bearing being a machine element that allows one part to bear (i.e., to support) another. The simplest bearings are bearing surfaces, cut or formed into a part, with varying degrees of control over the form, size, roughness and location of the surface. Other bearings are separate devices installed into a machine or machine part. The most sophisticated bearings for the most demanding applications are very precise devices; their manufacture requires some of the highest standards of current technology. The invention of the rolling bearing, in the form of wooden rollers supporting, or bearing, an object being moved is of great antiquity, and may predate the invention of the wheel. Though it is often claimed that the Egyptians used roller bearings in the form of tree trunks under sleds, this is modern speculation. They are depicted in their own drawings in the tomb of Djehutihotep  as moving massive stone blocks on sledges with liquid-lubricated runners which would constitute a plain bearing. There are also Egyptian drawings of bearings used with hand drills. The earliest recovered example of a rolling element bearing is a wooden ball bearing supporting a rotating table from the remains of the Roman Nemi ships in Lake Nemi, Italy. The wrecks were dated to 40 BC. Leonardo da Vinci incorporated drawings of ball bearings in his design for a helicopter around the year 1500. This is the first recorded use of bearings in an aerospace design. However, Agostino Ramelli is the first to have published sketches of roller and thrust bearings. An issue with ball and roller bearings is that the balls or rollers rub against each other causing additional friction which can be reduced by enclosing the balls or rollers within a cage. The captured, or caged, ball bearing was originally described by Galileo in the 17th century. The first practical caged-roller bearing was invented in the mid-1740s by horologist John Harrison for his H3 marine timekeeper. This uses the bearing for a very limited oscillating motion but Harrison also used a similar bearing in a truly rotary application in a contemporaneous regulator clock. The first modern recorded patent on ball bearings was awarded to Philip Vaughan, a British inventor and ironmaster who created the first design for a ball bearing in Carmarthen in 1794. His was the first modern ball-bearing design, with the ball running along a groove in the axle assembly. Bearings have played a pivotal role in the nascent Industrial Revolution, allowing the new industrial machinery to operate efficiently. For example, they saw use for holding wheel and axle to greatly reduce friction over that of dragging an object by making the friction act over a shorter distance as the wheel turned. The first plain and rolling-element bearings were wood closely followed by bronze. Over their history bearings have been made of many materials including ceramic, sapphire, glass, steel, bronze, other metals and plastic (e.g., nylon, polyoxymethylene, polytetrafluoroethylene, and UHMWPE) which are all used today. Watch makers produce "jeweled" watches using sapphire plain bearings to reduce friction thus allowing more precise time keeping. Even basic materials can have good durability. As examples, wooden bearings can still be seen today in old clocks or in water mills where the water provides cooling and lubrication. The first patent for a radial style ball bearing was awarded to Jules Suriray, a Parisian bicycle mechanic, on 3 August 1869. The bearings were then fitted to the winning bicycle ridden by James Moore in the world's first bicycle road race, Paris-Rouen, in November 1869. In 1883, Friedrich Fischer, founder of FAG, developed an approach for milling and grinding balls of equal size and exact roundness by means of a suitable production machine and formed the foundation for creation of an independent bearing industry. The modern, self-aligning design of ball bearing is attributed to Sven Wingquist of the SKF ball-bearing manufacturer in 1907, when he was awarded Swedish patent No. 25406 on its design. Henry Timken, a 19th-century visionary and innovator in carriage manufacturing, patented the tapered roller bearing in 1898. The following year he formed a company to produce his innovation. Over a century the company grew to make bearings of all types, including specialty steel and an array of related products and services. Erich Franke invented and patented the wire race bearing in 1934. His focus was on a bearing design with a cross section as small as possible and which could be integrated into the enclosing design. After World War II he founded together with Gerhard Heydrich the company Franke & Heydrich KG (today Franke GmbH) to push the development and production of wire race bearings. Richard Stribeck’s extensive research  on ball bearing steels identified the metallurgy of the commonly used 100Cr6 (AISI 52100)  showing coefficient of friction as a function of pressure. In the early 1980s, Pacific Bearing's founder, Robert Schroeder, invented the first bi-material plain bearing which was size interchangeable with linear ball bearings. This bearing had a metal shell (aluminum, steel or stainless steel) and a layer of Teflon-based material connected by a thin adhesive layer. Today ball and roller bearings are used in many applications which include a rotating component. Examples include ultra high speed bearings in dental drills, aerospace bearings in the Mars Rover, gearbox and wheel bearings on automobiles, flexure bearings in optical alignment systems, bicycle wheel hubs, and air bearings used in Coordinate-measuring machines. By far, the most common bearing is the plain bearing, a bearing which uses surfaces in rubbing contact, often with a lubricant such as oil or graphite. A plain bearing may or may not be a discrete device. It may be nothing more than the bearing surface of a hole with a shaft passing through it, or of a planar surface that bears another (in these cases, not a discrete device); or it may be a layer of bearing metal either fused to the substrate (semi-discrete) or in the form of a separable sleeve (discrete). With suitable lubrication, plain bearings often give entirely acceptable accuracy, life, and friction at minimal cost. Therefore, they are very widely used. However, there are many applications where a more suitable bearing can improve efficiency, accuracy, service intervals, reliability, speed of operation, size, weight, and costs of purchasing and operating machinery. Thus, there are many types of bearings, with varying shape, material, lubrication, principle of operation, and so on. Animation of ball bearing (without a cage). The inner ring rotates and the outer ring is stationary. Plain bearing, consisting of a shaft rotating in a hole. There are several specific styles: bushing, journal bearing, sleeve bearing, rifle bearing, composite bearing. Flexure bearing, in which the motion is supported by a load element which bends. Reducing friction in bearings is often important for efficiency, to reduce wear and to facilitate extended use at high speeds and to avoid overheating and premature failure of the bearing. Essentially, a bearing can reduce friction by virtue of its shape, by its material, or by introducing and containing a fluid between surfaces or by separating the surfaces with an electromagnetic field. By shape, gains advantage usually by using spheres or rollers, or by forming flexure bearings. By fluid, exploits the low viscosity of a layer of fluid, such as a lubricant or as a pressurized medium to keep the two solid parts from touching, or by reducing the normal force between them. By fields, exploits electromagnetic fields, such as magnetic fields, to keep solid parts from touching. Air pressure exploits air pressure to keep solid parts from touching. Combinations of these can even be employed within the same bearing. An example of this is where the cage is made of plastic, and it separates the rollers/balls, which reduce friction by their shape and finish. Bearing design varies depending on the size and directions of the forces that they are required to support. Forces can be predominately radial, axial (thrust bearings), or bending moments perpendicular to the main axis. Different bearing types have different operating speed limits. Speed is typically specified as maximum relative surface speeds, often specified ft/s or m/s. Rotational bearings typically describe performance in terms of the product DN where D is the mean diameter (often in mm) of the bearing and N is the rotation rate in revolutions per minute. Generally there is considerable speed range overlap between bearing types. Plain bearings typically handle only lower speeds, rolling element bearings are faster, followed by fluid bearings and finally magnetic bearings which are limited ultimately by centripetal force overcoming material strength. Some applications apply bearing loads from varying directions and accept only limited play or "slop" as the applied load changes. One source of motion is gaps or "play" in the bearing. For example, a 10 mm shaft in a 12 mm hole has 2 mm play. A second source of motion is elasticity in the bearing itself. For example, the balls in a ball bearing are like stiff rubber, and under load deform from round to a slightly flattened shape. The race is also elastic and develops a slight dent where the ball presses on it. The stiffness of a bearing is how the distance between the parts which are separated by the bearing varies with applied load. With rolling element bearings this is due to the strain of the ball and race. With fluid bearings it is due to how the pressure of the fluid varies with the gap (when correctly loaded, fluid bearings are typically stiffer than rolling element bearings). Fluid and magnetic bearings can have practically indefinite service lives. In practice, there are fluid bearings supporting high loads in hydroelectric plants that have been in nearly continuous service since about 1900 and which show no signs of wear. Rolling element bearing life is determined by load, temperature, maintenance, lubrication, material defects, contamination, handling, installation and other factors. These factors can all have a significant effect on bearing life. For example, the service life of bearings in one application was extended dramatically by changing how the bearings were stored before installation and use, as vibrations during storage caused lubricant failure even when the only load on the bearing was its own weight; the resulting damage is often false brinelling. Bearing life is statistical: several samples of a given bearing will often exhibit a bell curve of service life, with a few samples showing significantly better or worse life. Bearing life varies because microscopic structure and contamination vary greatly even where macroscopically they seem identical. Bearings are often specified to give an "L10" life (outside the USA, it may be referred to as "B10" life.) This is the life at which ten percent of the bearings in that application can be expected to have failed due to classical fatigue failure (and not any other mode of failure like lubrication starvation, wrong mounting etc. ), or, alternatively, the life at which ninety percent will still be operating.The L10 life of the bearing is theoretical life and may not represent service life of the bearing. Bearings are also rated using C0 (static loading) value. This is the basic load rating as a reference, and not an actual load value. For plain bearings, some materials give much longer life than others. Some of the John Harrison clocks still operate after hundreds of years because of the lignum vitae wood employed in their construction, whereas his metal clocks are seldom run due to potential wear. Flexure bearings rely on elastic properties of material.Flexure bearings bend a piece of material repeatedly. Some materials fail after repeated bending, even at low loads, but careful material selection and bearing design can make flexure bearing life indefinite. Although long bearing life is often desirable, it is sometimes not necessary. Tedric A. Harris describes a bearing for a rocket motor oxygen pump that gave several hours life, far in excess of the several tens of minutes life needed. Depending on the customized specifications (backing material and PTFE compounds), composite bearings can operate up to 30 years without maintenance. For bearings which are used in oscillating applications, customized approaches to calculate L10 are used. The service life of the bearing is affected by many parameters that are not controlled by the bearing manufacturers. For example, bearing mounting, temperature, exposure to external environment, lubricant cleanliness and electrical currents through bearings etc. High frequency PWM inverters can induce currents in a bearing, which can be suppressed by use of ferrite chokes. The temperature and terrain of the micro-surface will determine the amount of friction by the touching of solid parts. Certain elements and fields reduce friction, while increasing speeds. Strength and mobility help determine the amount of load the bearing type can carry. Alignment factors can play a damaging role in wear and tear, yet overcome by computer aid signaling and non-rubbing bearing types, such as magnetic levitation or air field pressure. Many bearings require periodic maintenance to prevent premature failure, but many others require little maintenance. The latter include various kinds of fluid and magnetic bearings, as well as rolling-element bearings that are described with terms including sealed bearing and sealed for life. These contain seals to keep the dirt out and the grease in. They work successfully in many applications, providing maintenance-free operation. Some applications cannot use them effectively. Nonsealed bearings often have a grease fitting, for periodic lubrication with a grease gun, or an oil cup for periodic filling with oil. Before the 1970s, sealed bearings were not encountered on most machinery, and oiling and greasing were a more common activity than they are today. For example, automotive chassis used to require "lube jobs" nearly as often as engine oil changes, but today's car chassis are mostly sealed for life. From the late 1700s through mid 1900s, industry relied on many workers called oilers to lubricate machinery frequently with oil cans. Factory machines today usually have lube systems, in which a central pump serves periodic charges of oil or grease from a reservoir through lube lines to the various lube points in the machine's bearing surfaces, bearing journals, pillow blocks, and so on. The timing and number of such lube cycles is controlled by the machine's computerized control, such as PLC or CNC, as well as by manual override functions when occasionally needed. This automated process is how all modern CNC machine tools and many other modern factory machines are lubricated. Similar lube systems are also used on nonautomated machines, in which case there is a hand pump that a machine operator is supposed to pump once daily (for machines in constant use) or once weekly. These are called one-shot systems from their chief selling point: one pull on one handle to lube the whole machine, instead of a dozen pumps of an alemite gun or oil can in a dozen different positions around the machine. The oiling system inside a modern automotive or truck engine is similar in concept to the lube systems mentioned above, except that oil is pumped continuously. Much of this oil flows through passages drilled or cast into the engine block and cylinder heads, escaping through ports directly onto bearings, and squirting elsewhere to provide an oil bath. The oil pump simply pumps constantly, and any excess pumped oil continuously escapes through a relief valve back into the sump. Many bearings in high-cycle industrial operations need periodic lubrication and cleaning, and many require occasional adjustment, such as pre-load adjustment, to minimise the effects of wear. Bearing life is often much better when the bearing is kept clean and well lubricated. However, many applications make good maintenance difficult. For example, bearings in the conveyor of a rock crusher are exposed continually to hard abrasive particles. Cleaning is of little use, because cleaning is expensive yet the bearing is contaminated again as soon as the conveyor resumes operation. 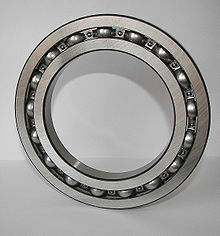 Thus, a good maintenance program might lubricate the bearings frequently but not include any disassembly for cleaning. The frequent lubrication, by its nature, provides a limited kind of cleaning action, by displacing older (grit-filled) oil or grease with a fresh charge, which itself collects grit before being displaced by the next cycle. Rolling-element bearings are widely used in the industries today, and hence maintenance of these bearings becomes an important task for the maintenance professionals. The rolling-element bearings wear out easily due to metal-to-metal contact, which creates faults in the outer race, inner race and ball. It is also the most vulnerable component of a machine because it is often under high load and high running speed conditions. Regular diagnostics of rolling-element bearing faults is critical for industrial safety and operations of the machines along with reducing the maintenance costs or avoiding shutdown time. Among the outer race, inner race and ball, the outer race tends to be more vulnerable to faults and defects. There is still room for discussion as to whether the rolling element excites the natural frequencies of bearing component when it passes the fault on the outer race. Hence we need to identify the bearing outer race natural frequency and its harmonics. The bearing faults create impulses and results in strong harmonics of the fault frequencies in the spectrum of vibration signals. These fault frequencies are sometimes masked by adjacent frequencies in the spectra due to their little energy. Hence, a very high spectral resolution is often needed to identify these frequencies during a FFT analysis. The natural frequencies of a rolling element bearing with the free boundary conditions are 3 kHz. Therefore, in order to use the bearing component resonance bandwidth method to detect the bearing fault at an initial stage a high frequency range accelerometer should be adopted, and data obtained from a long duration needs to be acquired. A fault characteristic frequency can only be identified when the fault extent is severe, such as that of a presence of a hole in the outer race. The harmonics of fault frequency is a more sensitive indicator of a bearing outer race fault. For a more serious detection of defected bearing faults waveform, spectrum and envelope techniques will help reveal these faults. However, if a high frequency demodulation is used in the envelope analysis in order to detect bearing fault characteristic frequencies, the maintenance professionals have to be more careful in the analysis because of resonance, as it may or may not contain fault frequency components. Using spectral analysis as a tool to identify the faults in the bearings faces challenges due to issues like low energy, signal smearing, cyclostationarity etc. High resolution is often desired to differentiate the fault frequency components from the other high-amplitude adjacent frequencies. Hence, when the signal is sampled for FFT analysis, the sample length should be large enough to give adequate frequency resolution in the spectrum. Also, keeping the computation time and memory within limits and avoiding unwanted aliasing may be demanding. However, a minimal frequency resolution required can be obtained by estimating the bearing fault frequencies and other vibration frequency components and its harmonics due to shaft speed, misalignment, line frequency, gearbox etc. Some bearings use a thick grease for lubrication, which is pushed into the gaps between the bearing surfaces, also known as packing. The grease is held in place by a plastic, leather, or rubber gasket (also called a gland) that covers the inside and outside edges of the bearing race to keep the grease from escaping. Bearings may also be packed with other materials. Historically, the wheels on railroad cars used sleeve bearings packed with waste or loose scraps of cotton or wool fiber soaked in oil, then later used solid pads of cotton. Bearings can be lubricated by a metal ring that rides loosely on the central rotating shaft of the bearing. The ring hangs down into a chamber containing lubricating oil. As the bearing rotates, viscous adhesion draws oil up the ring and onto the shaft, where the oil migrates into the bearing to lubricate it. Excess oil is flung off and collects in the pool again. Some machines contain a pool of lubricant in the bottom, with gears partially immersed in the liquid, or crank rods that can swing down into the pool as the device operates. The spinning wheels fling oil into the air around them, while the crank rods slap at the surface of the oil, splashing it randomly on the interior surfaces of the engine. Some small internal combustion engines specifically contain special plastic flinger wheels which randomly scatter oil around the interior of the mechanism. For high speed and high power machines, a loss of lubricant can result in rapid bearing heating and damage due to friction. Also in dirty environments the oil can become contaminated with dust or debris that increases friction. In these applications, a fresh supply of lubricant can be continuously supplied to the bearing and all other contact surfaces, and the excess can be collected for filtration, cooling, and possibly reuse. Pressure oiling is commonly used in large and complex internal combustion engines in parts of the engine where directly splashed oil cannot reach, such as up into overhead valve assemblies. High speed turbochargers also typically require a pressurized oil system to cool the bearings and keep them from burning up due to the heat from the turbine. Composite bearings are designed with a self-lubricating polytetrafluroethylene (PTFE) liner with a laminated metal backing. The PTFE liner offers consistent, controlled friction as well as durability whilst the metal backing ensures the composite bearing is robust and capable of withstanding high loads and stresses throughout its long life. Its design also makes it lightweight-one tenth the weight of a traditional rolling element bearing. There are many different types of bearings. Newer versions of more enabling designs are in development being tested, in which will reduce friction, increase bearing load, increase momentum build-up, and speed. Rubbing surfaces, usually with lubricant; some bearings use pumped lubrication and behave similarly to fluid bearings. Depends on materials and construction, PTFE has coefficient of friction ~0.05-0.35, depending upon fillers added Good, provided wear is low, but some slack is normally present Low to very high Low to very high - depends upon application and lubrication Widely used, relatively high friction, suffers from stiction in some applications. Depending upon the application, lifetime can be higher or lower than rolling element bearings. Off-center bearing rolls in seating Low Low due to flexing Low Adequate (requires maintenance) Mainly used in low-load, high precision work such as clocks. Jewel bearings may be very small. Fluid is forced between two faces and held in by edge seal Zero friction at zero speed, low Very high Very high (usually limited to a few hundred feet per second at/by seal) Virtually infinite in some applications, may wear at startup/shutdown in some cases. Often negligible maintenance. Can fail quickly due to grit or dust or other contaminants. Maintenance free in continuous use. Can handle very large loads with low friction. Faces of bearing are kept separate by magnets (electromagnets or eddy currents) Zero friction at zero speed, but constant power for levitation, eddy currents are often induced when movement occurs, but may be negligible if magnetic field is quasi-static Low No practical limit Indefinite. Maintenance free. (with electromagnets) Active magnetic bearings (AMB) need considerable power. Electrodynamic bearings (EDB) do not require external power. †Stiffness is the amount that the gap varies when the load on the bearing changes, it is distinct from the friction of the bearing. ^ Merriam-Webster, "headwords "bearing" and "bear"", Merriam-Webster's Collegiate Dictionary, online subscription version. Paywalled reference work. ^ a b American Society of Mechanical Engineers (1906), Transactions of the American Society of Mechanical Engineers, 27, American Society of Mechanical Engineers, p. 441. ^ Bryan Bunch, The history of science and technology. ^ Guran, Ardéshir; Rand, Richard H. (1997), Nonlinear dynamics, World Scientific, p. 178, ISBN 978-981-02-2982-5. ^ Bearing Industry Timeline, retrieved 2012-10-21. ^ "Double- Row Angular Contact Ball Bearings". Archived from the original on 11 May 2013. ^ "Bicycle History, Chronology of the Growth of Bicycling and the Development of Bicycle Technology by David Mozer". Ibike.org. Retrieved 2013-09-30. ^ Machine Design (2007), Did You Know: Bud Wisecarver (PDF), Machine Design, p. 1. ^ "Design News Magazine - July 1995". ^ a b Harris, Tedric A. (2000). Rolling Bearing Analysis (4th ed.). Wiley-Interscience. ISBN 0-471-35457-0. ^ Schwack, Fabian; Byckov, Artjom; Bader, Norbert; Poll, Gerhard. "Time-dependent analyses of wear in oscillating bearing applications (PDF Download Available)". ResearchGate. Retrieved 2017-08-01. ^ Schwack, F.; Stammler, M.; Poll, G.; Reuter, A. (2016). "Comparison of Life Calculations for Oscillating Bearings Considering Individual Pitch Control in Wind Turbines". Journal of Physics: Conference Series. 753 (11): 112013. doi:10.1088/1742-6596/753/11/112013. ISSN 1742-6596. ^ White, John H. (1985) . The American Railroad Passenger Car. 2. Baltimore, Maryland: Johns Hopkins University Press. p. 518. ISBN 978-0-8018-2747-1. ^ Gobain, Saint (1 June 2012). "Saint-Gobain and Norco Get Celebrity Thumbs-Up". Retrieved 9 June 2016. Wikimedia Commons has media related to Bearings. Kinematic Models for Design Digital Library (KMODDL) - Movies and photos of hundreds of working mechanical-systems models at Cornell University. Also includes an e-book library of classic texts on mechanical design and engineering. This page was last edited on 3 December 2018, at 03:39 (UTC).